D. Wenzel and D. Eberly, Group Algebras in Signal and Image Processing. R. Godehardt, Mirror Electron Microscopy. J.W. Grzymala-Busse, Rough Sets. F. Kahl and H. Rose, Theoretical Concepts of Electron Holography. S.C. Kak, Quantum Neural Computing. A.M. Zayezdny and I. Druckmann, Signal Description: New Approaches, New Results. References. Subject Index. Academic Press is pleased to announce the creation of Advances in Imaging and Electron Physics. This serial publication results from the merger of two long-running serials--Advances in Electronics and Electron Physics and Advances in Optical & Electron Microscopy. 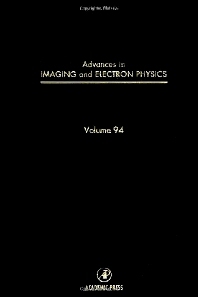 Advances in Imaging & Electron Physics will feature extended articles on the physics of electron devices (especially semiconductor devices), particle optics at high and low energies,microlithography, image science and digital image processing, electromagnetic wave propagation, electron microscopy, and the computing methods used in all these domains.